They're off to the races! "The Voice" completed its blind audition roundsMonday night with its pretty panel of coaches ready to take the competition to the finish line. Adam Levine, Christina Aguilera, Cee Lo Green and Blake Sheltonstarted the show with two spots left on their 16-member teams. As desperation for their final members hit a peak, even the coaches started taking sides. Body RevolutionIn lieu of Lady Gaga's recent Body Revolution Campaign, it seemed fitting her talented backup singer Chevonne also acknowledged battling an eating disorder, along with contestant Jessica Cayne. Chevonne's unique tone and strong voice caught Shelton's ear but hit a particular chord with Green. "I feel pain in your voice," Green told the singer. This prompted Chevonne to come clean of her past. "I could relate to you because I have written, on many occasions, from a painful place and there is a way to overcome it," a glassy-eyed Green continued. The cathartic moment was quite touching and completely overshadowed any nonsense pitch from Shelton. Chevonne went right in the hands of Cee Lo. No Boy Banders AllowedThat seems like the theme in season three of the singing competition as another boy bander bit the dust. Rod Michael found fame in his early twenties as part of the boy band B3. Unfortunately, the spotlight didn't translate into a career and Michael became obsessed with getting another chance. Putting all his eggs in the "Voice" basket, the singer won the hearts of the ladies but didn't put a dent in the coaches. "It was like '50 Shades of Grey' in here," Levine said to the disappointed singer. Although Michael had the looks, he lacked a real connection to the words. 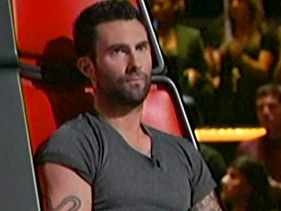 Levine put it best, "It's 'The Voice' not 'The Abs.' " Touché. The Legacy Lives OnCelica Westbrook is a third-generation singer who was offered a record deal and an opportunity to tour with Justin Bieber. But in a flash, it all fell apart. Refusing to give up, the young singer let her voice do the talking. The soulful, mature sound that came out was far beyond her 16 years and caught the attention of Aguilera, Green and Shelton. While her sound hit a "soft spot" for Green, Shelton and Xtina touted her star power. "As God is my witness, you have to be on the radio right now!" Aguilera proclaimed just before she nabbed Westbrook for her own. Don't Judge A Book By Its Cover We see it a lot on "The Voice" — the sound doesn't always match the look. It's part of the show's charm, and it was witnessed again with Rudy Parris, a raven-haired man clad in black. He looked a rocker but let out a soulful country version of Sting's "Every Breath You Take." Green and Shelton were both surprised by what they say, "You damn sure don't look country, but country's still in there," Shelton said, "I don't know what you're going to do about that but pick me." Parris took the final spot in the country singer's team, leaving Green shut out. Bam-Bam-Thank-Ya ... GreenCody Belew grew up in the rodeo. The country singer accidentally discovered soul music and expressed his belief that in his last life he had to have been "an elderly black lady" and his dream coach was none other than parrot-toting Cee Lo Green. It seemed like all hope was lost for Belew when started singing for the coaches; none of them were turning around. At the very last moment, Green pushed his button without Belew even realizing. When it dawned on him that he was picked by his idol, he screamed a few expletives in disbelief and jumped for joy. "That's the best reaction we've ever heard, ever," Levine said. Now that the teams are full, the real battles begin next week. Coaches are teaming up with guest mentors to hone the skills of the contestants and narrow down the playing field.